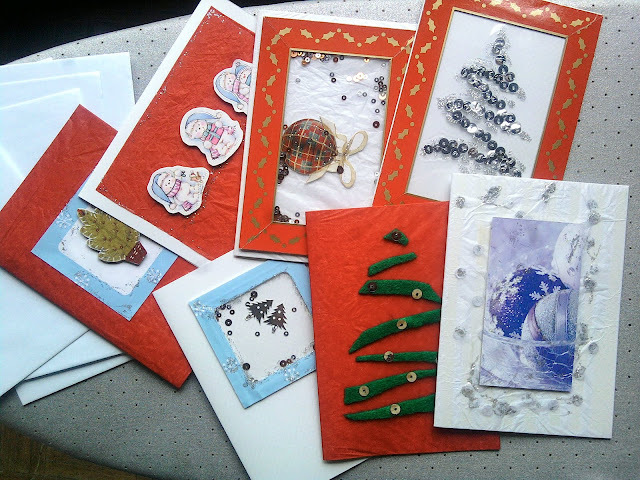 I have just made 8 Christmas cards (one of them already sealed in the envelope) to send to our family and friends - exactly 8 families. They are all made according to whatever I can find in my craft box: old felt I collected from God-knows-where, pretty pictures cut out from old magazines, old greeting cards, old mince pies boxes, tissue wrapping paper saved from packaging, sequins from old bag/shoe trimmings, etc. So you can see that they all look completely different - absolutely no homogenisation! The only NEW stuff I have used - really - are the envelopes. At least these cards will be appreciated more when received, as they contained real effort and love put into the card making process. They look great I am going to try them, thank you.